Usually Diamond releases their preview catalog on the 2nd to last Wednesday of the month which coincides with the week before that month’s issue of Sonic hits the stands, but presumably due to San Diego Comic Con going on last weekend, Diamond pushed back the release so that publishers could make their big announcements first! A week late, we finally have our first look at issue #10, “The Battle for Angel Island, Pt. 2”, scheduled to be available October 24th! The description seems pretty straight forward, except for who…or what this “super-powerful” enemy Sonic and Knuckles will be facing off against this issue. Is it the villain that was revealed in today’s issue or some formidable minion we have yet to see?! Per usually, Ian Flynn will be continuing the story with Tracy Yardley doing interior art. He will also be doing the B cover while Adam Bryce Thomas will be illustrating the A cover. Returning for her 10th consecutive cover, Nathalie Fourdraine will return for the RI cover! 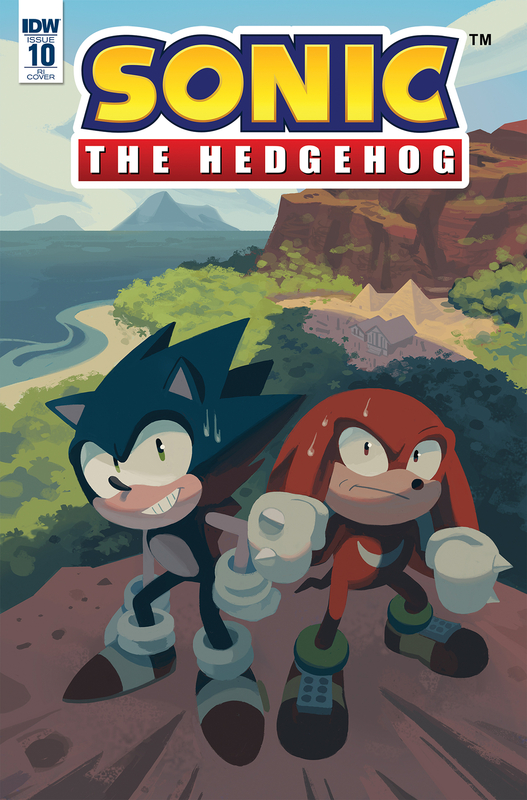 Likewise, the week after issue #10 is released, IDW will be publishing their first ever Sonic One-Shot on October 31st! Announced during SDCC 18, the special extra-long one-shot will be a tie-in the lead into the events of the upcoming game, Team Sonic Racing! Departing from the usual formula, Caleb Goellner, writer for several of the TMNT spin-off titles and Task Force Rad Squad, will be at the helm with Adam Bryce Thomas doing the interior and cover art. As far as I can tell, there is only one cover at this point, but I find it hard to believe there will not be more.